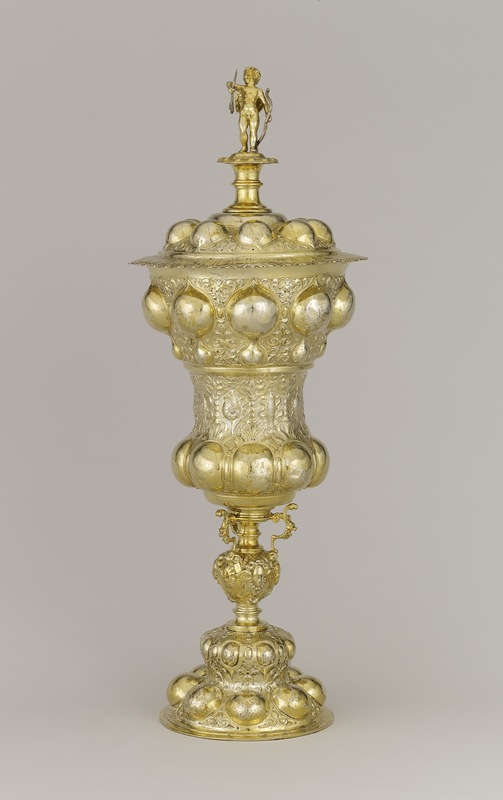 Standing cup and cover; silver-gilt; embossed and chased; bowl with constricted middle, chased with trophies of fish and birds among arabesques; above and below, row of bosses, that on lip being on ground of arabesque strapwork; baluster stem with three scroll brackets and female masks; foot embossed with eight knobs and chased; cover similarly decorated and surmounted by figure of Cupid; inscribed. Origin: Nuremberg; c. 1630; mark of Jacob Stoer (master 1626, died before 1659). (ii) The mark of Jacob Stoer (R3 4199). (iii) Austrian tax stamps, 1810-24 (R3 7887: F over TF conjoined). Commentary: Jacob Stoer came from Hamburg and became a master in 1626, when the influence of Hans Petzolt in Nuremberg was still a dominant force. Stoer, who lived and worked there for more than a quarter of a century, probably made this standing-cup and cover early in his career. The form of the cup corresponds so closely to some of the surviving works of Hans Petzolt, such as the Pressburg cup (WB.104), that Stoer could reasonably be accused of plagiarism. In particular, this zoological trophies cup should be compared with a cup of similar size, the Kress cup by Hans Petzolt, referred to in the curatorial commentary for WB.104 and currently on loan to the Germanisches Nationalmuseum, Nuremberg (see ‘Wenzel Jamnitzer und die Nürnberger Goldschmiedekunst 1500-1700’, exh. cat., Germanisches Nationalmuseum, Nuremberg, 1985o, p. 253, no. 70). Whereas the Kress cup is dated “um 1600”, the Jacob Stoer version cannot be earlier than 1626 and so has been tentatively dated “about 1630”. Jacob Stoer was evidently content, like so many craftsmen in Nuremberg, to stagnate and repeat the forms and styles that had been new and interesting a quarter of a century earlier. Although his stem includes a cast knop of unusual and pleasing quality, the baluster finial element (immediately above) is identical to the one used on the cover of Hans Petzolt's Pressburg cup (WB.104). The curvilinear outline of his embossed decoration, although closely derived from Petzolt, lacks the clarity and rhythm that characterises Petzolt's work. Whereas Petzolt uses the areas of engraved and chased decoration to emphasise the contrasting contours of his forms, Stoer's profusion of intricate and finely executed surface ornamentation serves only to blur and soften, thereby creating a restless, fussy lack of clarity. Stoer's chief area of ornamentation is the traditional middle waisted zone of the bowl of the cup, but instead of using a bold, clear pattern, or even a series of cartouches enclosing figures, he has created an apparently continuously repetitive pattern in low relief. On closer inspection, the low relief ornament contains nine wholly individual zoological trophies, each separated from the next by a strange, almost incomprehensible knobbly stem (?) of a plant. Stoer's source is not known, but unless there was an unrecorded revival in Nuremberg in the late 1620s, he may have been drawing upon engraved designs of the mid-sixteenth century, chiefly by Erasmus Hornick. Two of these designs were among those published in 1968 (see J. Hayward, The Goldsmiths’ Designs of the Bayerische Staatsbibliothek re-attributed to Erasmus Hornick, ‘The Burlington Magazine’, April 1968, pp. 201-6, figs 57-8). These two designs are very alike; both depict a single-handled ewer of Mannerist proportions with its ovoid, vase-shaped body decorated with festoons and, vertically suspended, with ribbons floating, there are single fish, large crabs, crayfish and mussels. One of the two is an etched design from the 1565 pattern book published in Nuremberg (and preserved in the Albertina, Vienna); the other was a pen and wash drawing that could be described as a more sophisticated version of the same scheme of decoration (sheet no. 25V. of the Liechtenstein Codex, sold after World War II and now in the collection of Mr Paul Wallraf). Another drawing, even closer to the zoological trophies of Jacob Stoer, shows a large vase with a swing handle and a small cover embossed with trophies of pairs of fish hanging by their heads and a wavy ribbon on either side; these pairs of fish alternate with turtles and crabs; there are vertically hanging crayfish (in the upper zone) and mussels with ribbons (in the lower zone). This drawing is among the 275 sheets in the Victoria and Albert Museum Codex now attributed, in part, to Erasmus Hornick (see J. F. Hayward, ‘Virtuoso Goldsmiths and the Triumphs of Mannerism 1540-1620’, Sotheby Parke Bernet Publications, London, 1976, p. 245, pl. 203, where it is described as “Antwerp, mid-16th century”). The same form of decoration was adapted by Erasmus Hornick of Antwerp for use on a circular dish or basin, as can be seen in the pen and wash drawing now in Mr Paul Wallraf s collection (see J. F. Hayward, The Mannerist Goldsmiths: 3. Antwerp, parts I-III, ‘The Connoisseur’, London, vol. 156, June/ July/ August 1964, p. 166, fig. 5). It is there noted that a somewhat different but related decorative use of crayfish occurs on the 1541-2(?) Antwerp covered tazza, the Founder's Cup, presented in 1584 to Emmanuel College, University of Cambridge, by Sir Walter Mildmay, who died in 1589 (see ‘Cambridge Plate’, Fitzwilliam Museum, Cambridge, 1975, no. sc 6, illus.). However, there is a very long gap of about eighty or ninety years before the standing-cup by Jacob Stoer seems uniquely not only to have revived this style but to have employed it in a wholly different manner - for the bold and almost frightening exaggerated realism of the Antwerp Mannerist approach has been replaced by a trivialising decorative monotony. Only the odd three-leaf knobbly plant motif, used by Stoer to separate each zoological trophy from the next, remains unintelligible and unrecognisable among the repertoire of late Renaissance ornament. However, it can perhaps be deduced that Stoer has loosely based it on Erasmus Hornick designs (such as the one in the Victoria and Albert Museum Codex which shows the two trophies, each comprising a pair of fish hanging by their heads, suspended from a vertical stem decorated with pairs of shells (mussels?) and, at the top, a three-leaf motif emerging above an oval boss). For a second, and equally feeble, use of the trophy of three fishes motif, see the silver-gilt basin by Evert Kettwyck, a Hamburg goldsmith, which since 1656 has been in the Moscow Kremlin (M. Bencard and G. A. Markowa, ‘Christian IV’s Royal Plate’, Rosenberg, 1988, no. 18). There remains, therefore, the intriguing speculation about the circumstances that led to Jacob Stoer making such an extraordinary borrowing, whether directly from the out-of-date Mannerist designs of Erasmus Hornick or, indirectly, via some mid-sixteenth-century piece of silver plate that incorporated those designs within its embossed ornament. Unfortunately the Waddesdon covered cup is, at present, the only extant work of Jacob Stoer listed by Rosenberg or any subsequent writer. Consequently, it is impossible to assess Stoer's significance within the story of Nuremberg's decline in the mid-seventeenth century. Borggrefe, Lüpkes & Ottomeyer, 'Moritz der Gelehrte : ein Renaissancefürst in Europa', Eruasberg : Minerva, 1997, p.122.